ham | Let There Be Food! Enter your email address to subscribe to this blog and receive notifications of tasty new posts by email. Do you say “to-may-toes” or “to-mah-toes”? What about “po-tay-toes” or “po-tah-toes”? What about “mini-fritattas” or “crustless quiche”? Yes dear friends, they are practically the same – as best I can tell. Truthfully, the label doesn’t really matter to me so much as the taste and ease with which they can be made. These are delicious and the variation possibilities are practically limitless – bound only by your taste buds and imagination. These are incredibly easy to make, as well. If you can make an omelet, you can make a fritatta, quiche, or mini version of either. This is a good dish for entertaining as it’s easy to serve, customizable, and still stress-free in the making. I made mine for some girlfriends who came over on a Thursday evening for a bit o’ Project Runway and breakfast for dinner. I enjoy breakfast for dinner as I don’t always have the time in the morning to make or eat a big breakfast. Thankfully, my friends are also “brinner” eaters! Hooray! 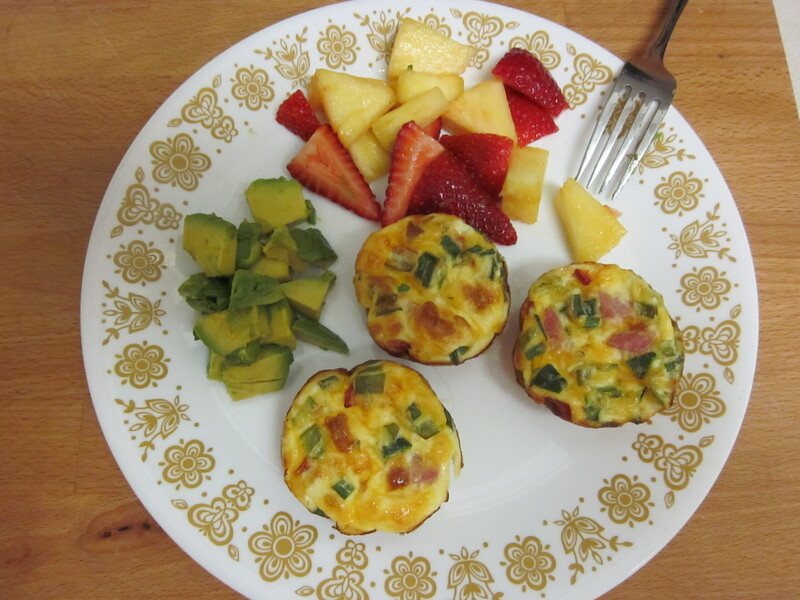 We paired our mini-fritattas with some avocado, fruit salad, and breakfast bread from Central Market. It was quite delightful. The original recipe came from Food Network, courtesy of Giada. I did some modifications to improve the nutritional content and judges’ ruling was that taste was not adversely affected. Hooray! 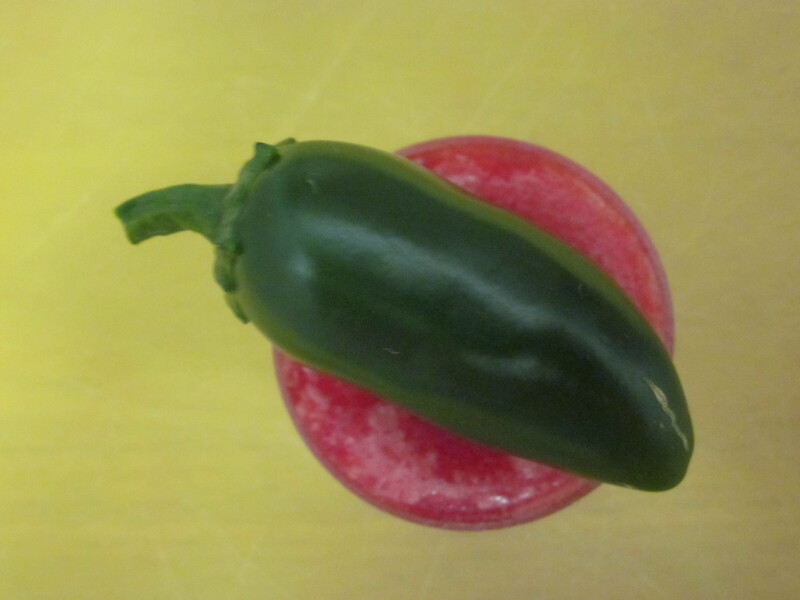 1/4 cup chopped peppers – I used a mix of 3 anaheim and jalapeño from my garden. 2. 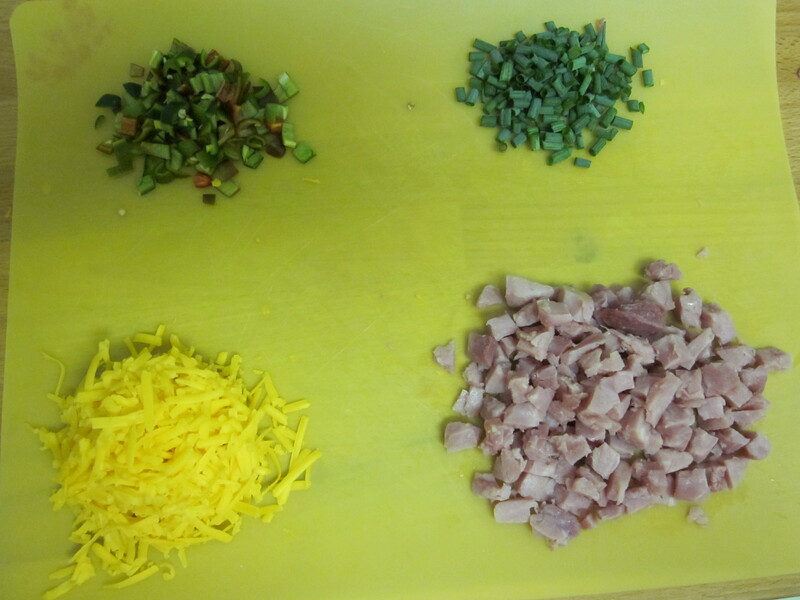 Prep all your “mix-ins” – grate cheese, chop ham, onion, and peppers. 3. In large bowl, whisk eggs, egg whites, and milk until a bit bubbly or foamy. 4. Add “mix-ins” to your egg mixture and stir to combine. Season with salt and pepper. 5. 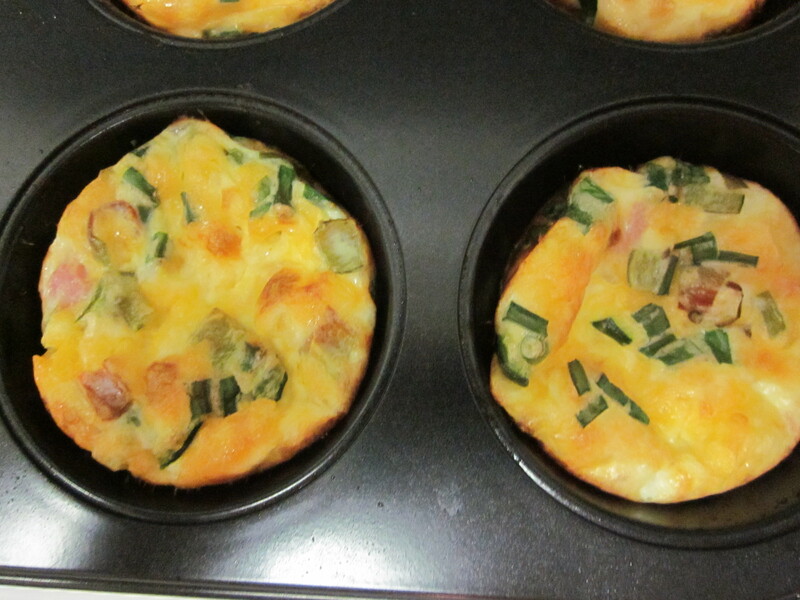 Spray a 12 cup muffin tin with non-stick spray. 6. Using a 1/4 cup measure, fill each muffin tin nearly to the top. One scoop should pretty much fill one muffin cup. 7. Bake until mixture sets, puffs a bit in the middle, and is a wee bit golden on top. This should take about 20 minutes, total. 8. When you remove from the oven, use a rubber spatula to loosen and remove from the pan. 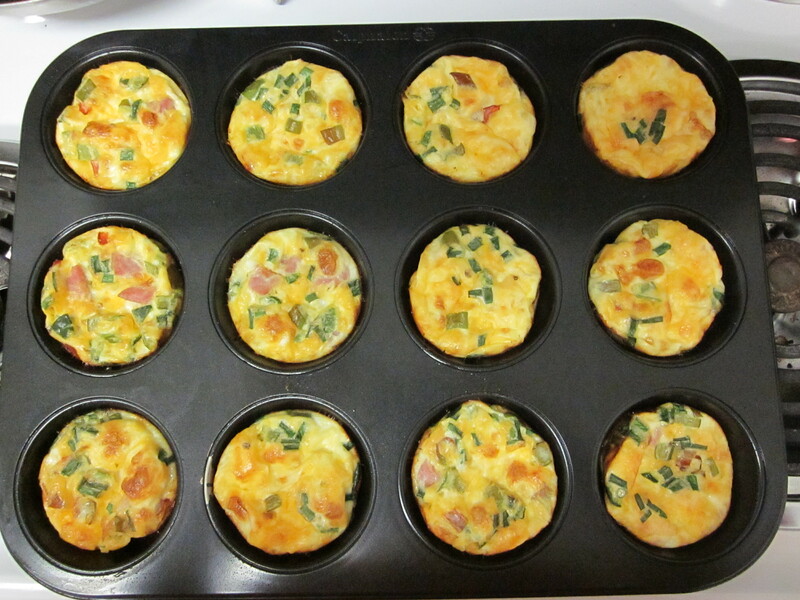 Don’t leave them in the pan to cool as they will condense underneath and create sort of soggy egg fritattas. As a sub for the milk, if you are feeling especially decadent – you can use half & half or heavy cream. You can also use 8 whole eggs if you don’t want to mess with separating the eggs. This will up the calorie and fat count, but sometimes a splurge is appropriate. 🙂 My suggestion for chopping the green onions is to get a pair of kitchen shears and put them to good use. My experience is that the scissor cutting method makes quick work. I grow green onions on my balcony – they are so easy! You take the tail end of the white/root part of the onion and stick it in some dirt. Water and wait and within days you will begin to see new growth. I have three pots so I can always snip what I want – and they always regrow! It’s pretty awesome and I’m never out of green onion. For your mix-ins, I recommend using no more than 4 or 5 ingredients so that you can still taste individual flavors and not have it too muddled in your mouth. Any cheese and meat combination would work. If you use a saltier cheese and/or meat, make sure you adjust your salt seasoning accordingly. Herbs would be a great addition: parsley, cilantro, rosemary, etc. Regular onion either raw or sauteed a bit prior would be delicious. 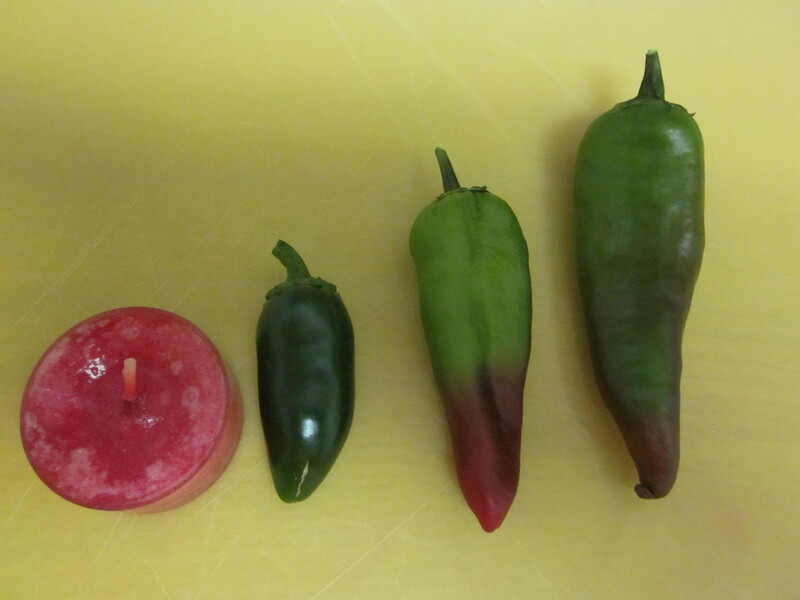 In my opinion, any kind of pepper would be good – adjust the heat by leaving in or removing the seeds and ribs. Keep it traditional for brunch/breakfast sharings or try shrimp and goat cheese for an evening soiree. Use spinach, tomato, and mushroom to keep it meat-free. Think of the egg/milk mixture as a blank canvas willing to take on whatever colors and flavors you wish to impart. 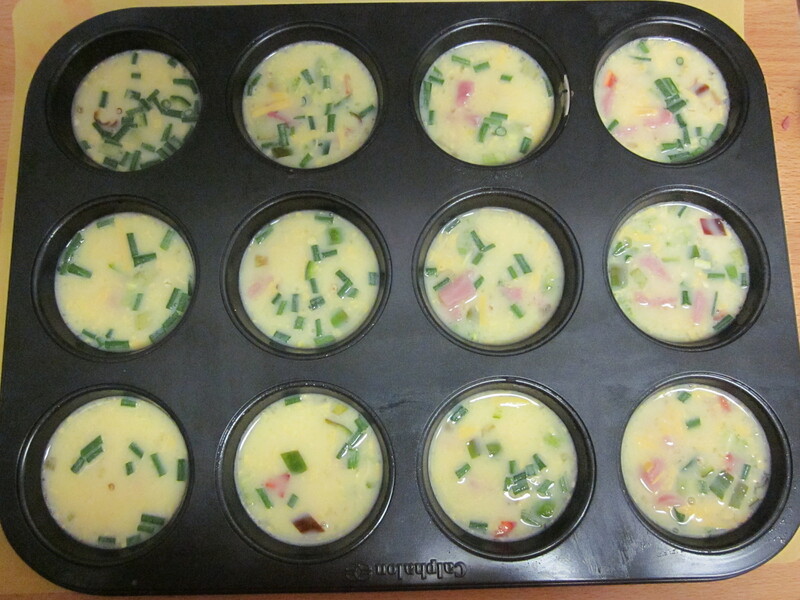 Lastly, if you own mini-muffin tins, you could use that to make bite-size appetizers. According to Giada, the recipe should make roughly 40 mini fritattas and only needs to bake about 10 minutes. As a single gal, having either 40 mini or 12 regular size muffin fritattas is a wee bit much. The reviewers on Food Network claim that these make good leftovers for the week. I haven’t personally had this experience because my typical MO when I want to make something like this is to see who of my friends is willing to come over and be a culinary guinea pig. Thankfully, they are frequently willing. 🙂 Alternatively, because all the ingredients are easily dividable, one could cut the recipe into half or even quarters (use 1/8 or 2 tbsp milk) to cook a smaller batch. Thursday night the three of us scarfed all 12 of these down without a problem. And they are pretty nutritionally smart so I didn’t feel so bad about it at all! I hope you and your friends enjoy these too. Happy eating!